Put simply Perry is to Pears as Cider is to Apples. Perry is an alcoholic beverage made from fermented pears, similar to the way cider is made from apples. It has been a common beverage in England for centuries, however not so common in Australia until more recent years. You will often hear commercial Perry being referred to as ‘Pear Cider’. Here at Paracombe Premium Perry we use different varieties of eating pears from our family orchard in Paracombe. Each Perry we produce is unique and distinctly different from the other. Our Shed Door now offers Tasting Paddles, where you can tantalize your taste buds with a range of Perry’s, Cider and our Eau de vie. We also have unique blends on tap that will be rotated, ensuring there will always be something new to try. 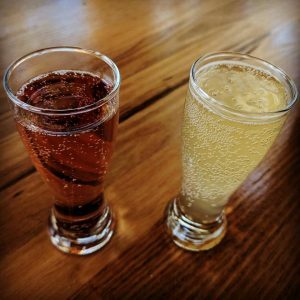 If you would like to know more about what happens to produce a golden sparkling Cider or Perry or discover something different please Contact Us to arrange a tour and tasting.